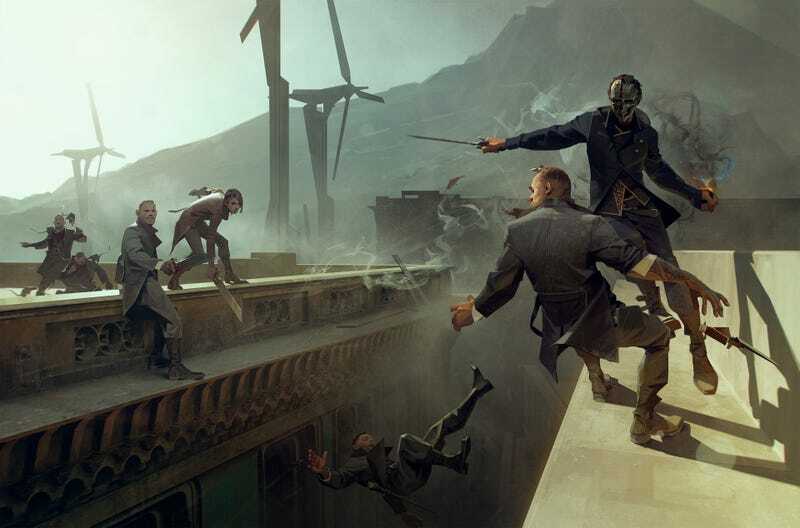 Today, the PC version of Dishonored 2 got a beta update that adds new custom difficulty settings as well as options for mission restart and mission select. Those custom options are a welcome addition—if you’re still playing Dishonored 2, chances are you’d like to be able to fine-tune how much noise your footsteps make. The update is currently only in the PC beta branch, but it’ll hit the console and non-beta PC version in the near future. Here are the settings you can tweak when setting up a custom difficulty, which can apply to a new game or a New Game +. Most of those are self-explanatory. “Attack frequency” governs how often enemies attack you in combat, “group attack” governs the number of enemies who’ll simultaneously engage you, and “ammunition quantity” governs how much ammo you find in a given level. Unfortunately “mana replenish” is just an off/on toggle, so you can’t speed up how fast mana replenishes after you blink. I’m enamored of the “number of reinforcements” option, since I’m tending more toward high chaos and want there to be lots and lots of people to fight. “Save model” gives you the option to constrain yourself to a single save slot, which I like, since it’ll make me own every decision without the absurd difficulty of a permadeath run. After the update, the game also lets you choose from a mission select screen, though it won’t reverse-populate your in-progress games. That means I can’t select from missions I’ve completed in my two existing saved games. When I started a third new game, I had the option to choose the first mission, but the mission select screen is empty for my other two campaigns, and the “restart mission” option in the menu is greyed out in those games. Given that the mission select maintains your campaign progress (upgrades, choices, etc. ), it makes sense that it’d be challenging to reverse-engineer existing campaigns. It’s still too bad that I have to replay the whole game to access mission select, and makes me wish this feature had been in the game from the start. I’m getting ready to finish up my first New Game+, after which I’m going to come up with my own custom difficulty that’s even more custom than the ones made possible by this update. I’m happy for more customization options, but it’s never enough!